Located in the Cevennes National park, the garden is in proximity of Le Vigan, Ganges and Valleraugue, of the “cirque de Navacelles” and the Mont Aigoual. 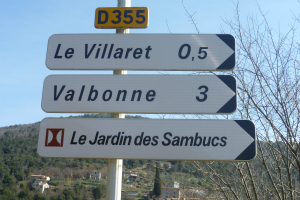 To get to the Jardin des Sambucs, Do not go the wrong way! : Hameau le Villaret, D355, Commune de st André de Majencoules 30570. Train stations and Airports in Nîmes and Montpellier, D40 Bus route from the Nîmes train station, 108 Bus route from the Montpellier train station.